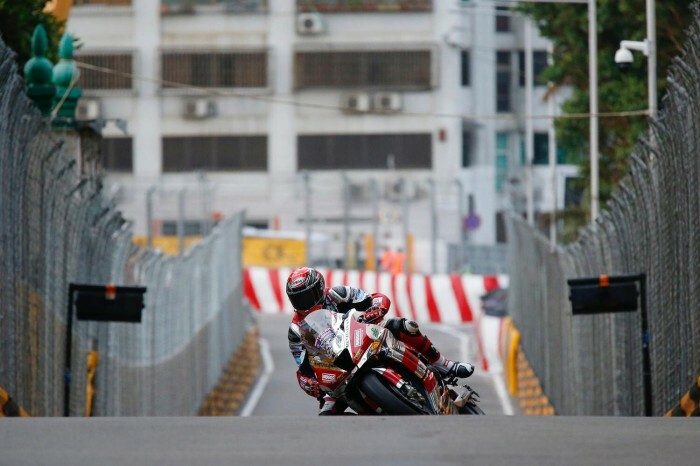 Gary Johnson overcame the discomfort of a back injury to put the Briggs Equipment Kawasaki in fourth place on the grid ahead of tomorrow’s Macau Grand Prix, only missing out on a front row start in the closing stages of today’s final qualifying session. The Lincolnshire ace sustained damaged vertebrae in a spill at the final round of the Pirelli National Superstock 1000 Championship at Brands Hatch last month, subsequently missing a final test on the Kawasaki ZX-10R he last raced in the Senior TT. With a number of changes to the front end of the machine since June, Johnson, a podium finisher at Macau in 2013, had to use Thursday’s free practice as extra testing, ending the session in 13th, but with additional changes to the rear suspension, fifth place in first qualifying later in the afternoon was a more accurate representation of his pace and potential. Indeed, a lap of 2’25.733s in today’s final qualifying session saw him move up to third on the leaderboard and it was only a late lap from Martin Jessopp that denied him a front row start. Nevertheless, the 37-year old is feeling confident ahead of the race although he recognises 12 laps around the 3.8-mile Guia will, as always, be a challenging proposition. “The back injury put me on the back foot a bit so I was a bit rusty in first practice and whilst the changes we’d made to the front were a significant step forward, it altered the feeling I had with the rear,” said Johnson. “The team have been working fantastic ever since we got here and the bike felt a lot better in first qualifying and I was starting to get more and more dialled in so fifth place was a bit more like it. “Second qualifying was better still and the further improvements we made were a big step forward and I did a good nine laps on what will be our race tyre. The lap times were strong so I feel confident about my race pace and set-up. We put in the qualifying tyre and I was able to make good use of it despite making a small mistake in the last sector which ultimtaley cost me P3 with Martin pipping me right at the end of the session.